Good morning! Well, the work week is halfway over, and it's a rainy, gloomy and chilly day, so I'm bringing out some warmth and cheer with this sweet little gnome card. "Bloom where you are planted."... Isn't that a wonderful thought? I surely think so, and making cards with this PK-564 Teamwork stamp set gives you the opportunity to share that wonderful sentiment of encouragement any time. The sweet faces on these cuties brings a smile and warms the heart. I ♥ them!!! This sweet image was stamped with Memento Tuxedo Black ink and colored with my Copics. All of the card stock and patterned paper, as well as the balsa wood tree came from the March Peachy Picks Kit. To color the tree, I used a variety of green Copic markers and air brushed it. The trunk of the tree is wrapped with orange and white twine from Jillybean Soup, and I added some to the top of the card as well. The negative die cut panel was done using the new nesting dies from Stampin' Up!, and the scalloped edging was done using the scalloped ribbon punch, which is also from Stampin' Up!. I've said it so many times before, and I'll say it again (A little differently this time). These monthly clubs are the bomb diggity!! 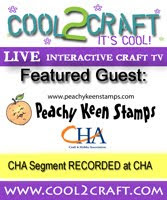 Just drop by the Peachy Keen Stamps Store and click on the Peachy Keen Clubs link to find out all the details about how to enroll and have all this peachy goodness arriving on your doorstep every single month. There are special "perks" to being a member, and there's a new kit due out soon, which you're just gonna LOVE!! Thanks so much for dropping by today. I hope this little card brings you a smile and warmth today. We sure need it here. I think we've got a little bit of everything going on as far as weather goes in this country. Snow in the northwest, rain in the heartland, and warm springtime temps in the east. Yep! I think we've got it covered!! Have a glorious day and enjoy some happy stamping while you're at it!! Cute! Cute! Cute!!! I love the gnome... and that is one of my all-time favorite sentiments! Simply Adorable. Love the way you colored those sweet images.